Do you have a favorite shirt that you feel uncomfortable wearing to work because it shows more cleavage than you’d like? If you’ve tried pinning your tops or wearing a full camisole or tank top under them, you may have considered buying the Cami Secret product, available through TV advertisements as well as online and in many retail stores. 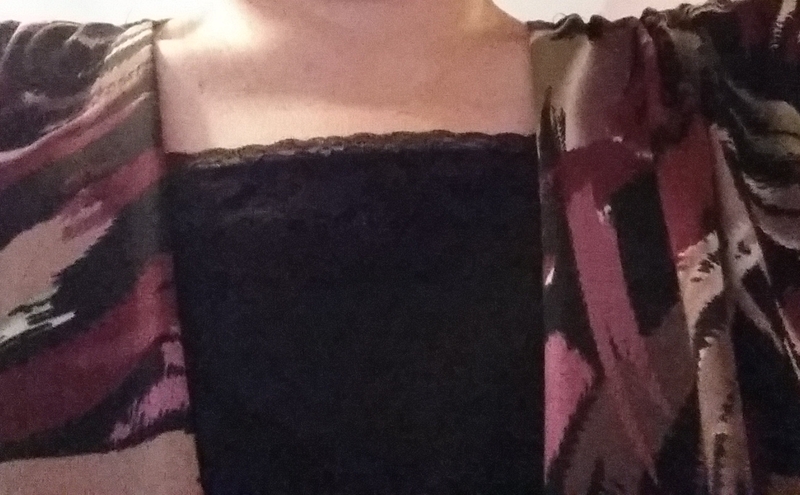 I approached my own Cami Secret review with some skepticism based on the mostly negative reviews I’d seen online. The Cami Secret package comes with white, ivory/cream and black panels, which are fairly thin with an attractive lace trim at the top. The Cami Secret uses snaps on either side of it to attach easily to your bra straps. I tried the black Cami Secret with a shirt of mine that tends to show off the goods if I’m not careful. I had no trouble attaching the Cami Secret properly and arranging it so that it looked like either part of the shirt or like a full camisole. I absolutely love this thing! I have several shirts that I don’t wear very often because I find them too revealing, especially if I need to bend over for some reason. The black, ivory and white colors should go with just about anything, too. 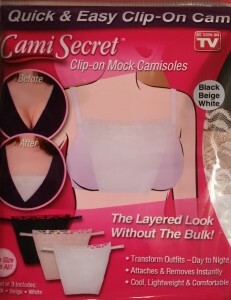 I can’t wait to try the Cami Secret panels with my other shirts. I don’t like wearing a full cami or tank under a shirt, and pinning the V-neck on a shirt either doesn’t work for me or looks awkward. With Cami Secret, I can wear my shirts with confidence and nobody will be the wiser. A three-pack of Cami Secret costs less than $10 on Amazon.com, and I can’t figure out for sure why so many users have panned it. Perhaps the product doesn’t work well with some types of bras or for women of certain bust sizes. Some reviewers complain about the flimsy fabric, but I think they miss the point of the product. Cami Secret isn’t a piece of clothing – it’s an accessory, and for me, it definitely did the job it claimed it would do. Note: A family member gave me a Cami Secret as a gift. I did not receive a free testing sample for this Cami Secret review.